Probability is the likelihood that a particular event will occur. This is the principle on which thousands of businesses and activities are based, ranging from the mundane one of insurance to the romantic one of space exploration. The application of these principle can be most complex or, as in the case of backgammon, very simple. In either event, probability is a science and, when properly applied in a game, can be of inestimable value in helping you to win. For it is the probabilities that determine the odds, and when you know which move of several is the best one because of the odds of being hit, or because of the odds of covering a blot, then you will be playing backgammon with skill — and for blood! Of course, luck can be of great importance at any given moment. We have all been in games where you — or your opponent — needed the one great throw, and made it; this can always happen. But I love to play against the man who counts on luck; he is an easy mark for me and for the casinos. The simple fact is that anyone I know who has ever laid claim to a fantastic streak of luck has also forgotten the fantastic streaks of bad luck he has had, both before and after. However, even when luck is a major factor, you still need as much skill as possible so that you can capitalize on the luck when it comes. 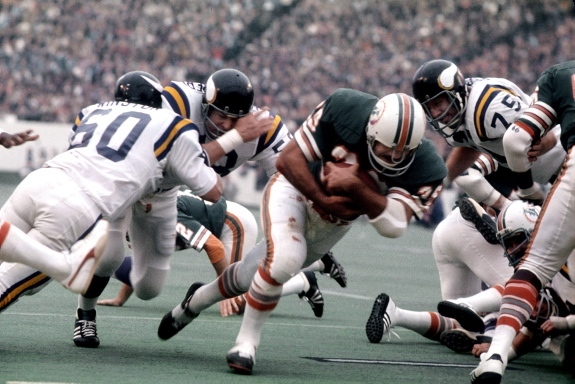 In the Super Bowl game, for example, played in deadly earnest with a lot of money at stake for each player, luck is all-important, for both teams are generally so closely matched in skill that it is the luck of the fumble, or the interception, or the called-back touchdown, that can make the difference between winning and losing. But the Super Bowl is a one-shot affair. If you’re a backgammon player, you will be playing anywhere from ten to fifty games at a sitting, so that you can depend on the luck — a fickle mistress at best — averaging out the skill of the player becoming of paramount importance. Some players may question this; I have seen them. They are the ones who have had what they explain as a bad run of dice all evening; watching them, I feel that they made some stupid mistakes (maybe only one per game) which became compounded and led to their demise. If you still believe that luck is all-important and you must depend on it to win, you are wasting you time reading any further. But I would like to play you some day — for lots of money. There are a few simple principles of probability that must be understood. A knowledge of them is all that is essential to a consistently skillful and winning game. 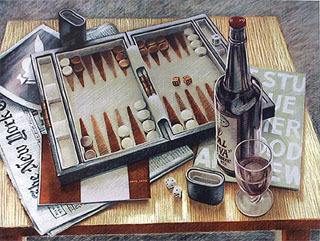 First, one must know the total number of possibilities that can occur; mathematicians call this the “sample space.” In backgammon, as in craps, the dice can be thrown in a total of thirty-six combinations. There are many backgammon players who will argue avidly that there are only twenty-one, but they are talking about the number of possible moves, not the number of possible throws. 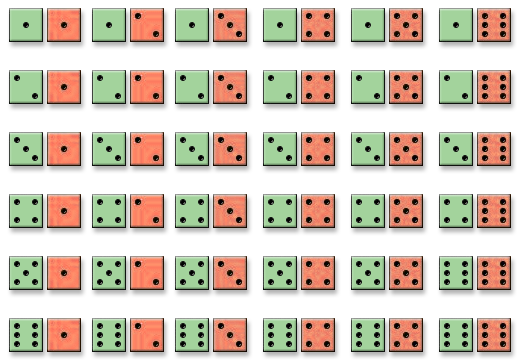 Assuming an honest die (a cube evenly made, neither weighted nor shaved), the logical and theoretical possibility of rolling any number is equal to that of rolling any other number. That is, all of the six numbers on a die are equally likely to happen. Obviously, if you throw a die only six times, you cannot expect to get each number once (the probabilities of that happening are 1 in 65!). This is because of another law in probability: the law of large numbers. Simply put, you cannot depend on the theoretical probability showing up in a small number of trials. However, the larger the number of throws, the greater the accuracy. What this means to you, therefore, is that the more you play backgammon over a period of time, the more the law of probability will work in your favor. So, each die can be thrown in six possible ways. If we imagine one die is black and one green, it will be easier to see the results. Assume the green die comes up 1. The black die can be 1, 2, 3, 4, 5, or 6, for six possible combinations: 1-1, 1-2, 1-3, 1-4, 1-5, 1-6. You will see that there are, in fact, a total of thirty-six possible combinations, without duplication and without overlooking any possibilities. This, then, is the sample space. From this we can figure how many possible ways each number can be thrown. Unlike craps, where it is the total of the two dice that counts, a blot can be hit not only by the total of the two dice but also when the proper number of points shows on either die individually. This is where the craps player often gets into trouble. I have won often against one who was using in backgammon the same odds he would at the craps table, thinking he was using the same dice, only to discover to his chagrin that he had erred more than slightly. In craps, the most probable sum is a 7. It can be rolled six ways: with a 4-3, 3-4, 5-2, 2-5, 6-1, or 1-6. The next easiest sums to roll are a 6 or an 8, each of which can be rolled in five ways. The 6 can be made by a 4-2, 2-4, 5-1, 1-5, or 3-3. The 8 can be made by 5-3, 3-5, 6-2, 2-6, or 4-4. However in backgammon the 6 can be hit in seventeen ways! — 1-6, 6-1, 2-6, 6-2, 3-6, 6-3, 4-6, 6-4, 5-6, 6-5, 1-5, 5-1, 2-4, 4-2, 2-2, 3-3, and 6-6. But the 8 can be hit only six ways: 5-3, 3-5, 6-2, 2-6, 2-2, and 4-4. The 7 can also be hit in only six ways: 4-3, 3-4, 5-2, 2-5, 6-1, or 1-6. So, the craps player, thinking he is equally safe in backgammon on a 6 point or 8 point, or that he is safer on a 6 point than a 7 point, is very, very wrong! Table 2 shows the total number of ways each number can possibly be thrown. The odds, should you care to figure them, can then be computed from these two figures. Let’s say, for example, you want to know the odds of being hit if you are eight points away. Assuming no intervening points are covered by you, there are six possible ways an eight can be hit, and therefore thirty ways it cannot be hit (the possibilities subtracted from the sample space). The odds against being hit, then, are 30 to 6, or 5 to 1. However, this can be awkward when you try to figure the odds for certain blots. For example, a man nine points away can be hit in five ways out of thirty-six, which gives you odds of 31 to 5 against being hit. This reduces to a very unwieldy 6.2 to 1. Or try a blot one point away, which can be hit in eleven out of thirty-six ways, for odds of 25 to 11 against being hit. This reduces to 2.272 to 1 against. Why bother? For all practical purposes, it is much easier, faster, and less cumbersome for you to memorize Table 3, and to use this information in a relative way: for example, a blot nine points away can be hit in five ways, whereas one ten points away can be hit in only three ways. In other words, the blot nine points away is almost twice as vulnerable! The enormous value of this knowledge becomes obvious when you realize the following fact: if you were not hit at all, it would require the movement of only seventy-seven points to get all your men into your inner board, ready to bear off. The loss of merely eight points makes your task 10 percent harder and proportionately decreases your possibilities of winning. Conversely, putting yourself in a position where you may be hit and then, in turn, hit back, may be advantageous where you lose only six or seven points and you opponent may lose fifteen or more. The knowledge of how many ways a number can be hit, therefore, becomes vital. It affects every move you make, from your opening to bearing off. Therefore, Table 3 should be committed to memory. There is one trap to avoid, which I would like to emphasize here. There is a third rule in probability, called the maturity of the chance. 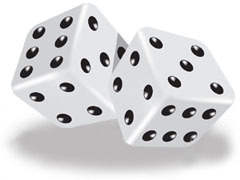 Many times the player who has not rolled a double, for example, in ever so long and now needs one to win, is likely to think that his probability of doing so is increased. This is a fallacy based on the belief that the dice have a memory or a consciousness, and that there is a better chance of a number coming up because it has appeared less frequently than others. This is simply not so: no number has its “share” of the results; there is no equilibrium to be restored. The dice are inanimate; they do not know or take into account any of their previous rolls; they have no memory. Each throw of the dice is completely new and individual to itself, and the behavior of the dice is not influenced in the slightest by past throws. The probabilities of the next throw remain precisely the same as they always were before, and as they always will be, no matter what has previously been thrown. What is really valid is the dependability — that is, the probability — of the dice, not their predictability. And it is this dependability that you should know and use. Now, I could prepare tables that would show how easy or hard it is to hit an opponent’s blot when he has intervening points covered, but to me this is a waste of time. I have not memorized this, nor do I intend to; it is too burdensome. The simple rule of thumb is that no matter how many points are covered by your opponent between your man and the blot, the possibilities of hitting do not drop that drastically. If you really must know the relative possibilities, one figure to keep in mind as a basis is: if the blot is anywhere within six points of your man, even if all the intervening points are covered, you always have eleven ways out of thirty-six to hit. As an example, take a blot five points away. If all four of the intervening points are open, you can hit it in fifteen ways. If all the intervening points are covered, you can still hit it in eleven ways: with a 1-5, 5-1, 2-5, 5-2, 3-5, 5-3, 4-5, 5-4, 5-5, 5-6, or 6-5. So you see that even with all four intervening points blocked by your opponent, the reduction in your chances to hit is only from fifteen to eleven. This is why Table 3 is really all that is important and necessary. Know it cold. Should you have two places to hit from, you can approximate the possibilities by adding the ways for each to hit; there might be some overlap, but for a quick generalization this will work. And this is also the case even with intervening points covered by your opponent. Take the board in Diagram 10, for example. You can hit the blot on the B8 point in eleven ways from the B3 point, and in eleven ways from the B2 point, which would suggest twenty-two ways of hitting. However, the 5-6 and 6-5 throws are duplicated, since they work for either blot, and therefore the actual number of throws that will hit the Black blot in this situation is twenty out of thirty-six. For the purpose of the moment it is enough simply to add the two totals. Only nine throws: 3-3, 4-4, 6-6, 3-4, 4-3, 3-6, 6-3, 4-6, and 6-4, will prevent his entering; the other twenty-seven throws will bring him in. That’s 3 to 1 in favor of getting in. This information about re-entering when you’re on the bar is not of value merely to win drinks; it’s not an alcoholic’s game we’re playing. This is information which is important for you when making certain decisions, particularly in connection with the riskiness of blots. Its value will become more and more apparent the more you play and utilize it. Just be sure to keep it in mind. But if you’re a drinking man, you might as well win drinks no matter how many points are covered. For example, with one point covered, many people say it’s 5 to 1 to get in on the first throw; same reasoning. Actually, it’s 35 to 1 in favor; only a double 6 will prevent Black’s entry. With two points covered, the odds in favor are 8 to 1. Again, it makes no difference which two points are covered; the odds are the same. (This is because when entering we do not use the total of the two dice as we do to hit a blot; here it is only the face number of each die that controls.) Assume the 6 and 5 points are the two covered, as in Diagram 13. The man on the bar is prevented from coming in by only four throws: 5-5, 6-6, 5-6, and 6-5. All thirty-two other throws are good; the odds, therefore, are 32 to 4 or 8 to 1 in his favor. The man on the bar cannot come in with 2-2, 3-3, 5-5, 6-6, 2-3, 3-2, 2-5, 5-2, 2-6, 6-2, 3-5, 5-3, 3-6, 6-3, 5-6, or 6-5; a total of sixteen ways. He can come in twenty ways, which means the odds are 5 to 4 in his favor. Black can get in with a 1-1, 1-2, 2-1, 1-3, 3-1, 1-4, 4-1, 1-5, 5-1, 1-6, 6-1, for a total of only eleven ways with twenty-five ways no good. The figures in Table 4 are important and should be known. Although the possibilities of re-entering decrease markedly as more and more points are closed, the really big difference occurs when the fifth point is covered. Not only are the possibilities of re-entering cut almost in half by virtue of this one point, but also there is now less than a 50 percent chance of coming in on the first throw. So I strongly advise great caution once the fifth point is made or seems likely to be made. With two men on the bar, it obviously becomes much more difficult to bring both men in on the first throw. I won’t burden you with the analysis of it; the results are in Table 5. The moral of the information then, is to avoid like the devil having two men hit at once; conversely, it is almost worth selling your soul to put two of your opponent’s men on the bar at once. A 6-4 throw by Black is ominous, but there are only two ways out of thirty-six of throwing this combination, or any specific combination, for that matter. So, if you need — or fear — a specific throw, the odds are 34 to 2, or 17 to 1 against its being thrown. As for doubles, there are six ways out of thirty-six to throw a double, or five to one against throwing one. And to throw a specific double, there is only one way out of thirty-six — or odds of 35 to 1 against throwing it. The last probability you should know — and as far as I’m concerned the most important one in this book — is not a mathematical probability. However, I can attest to both its validity and value: to lose, all you probably need do is make one mistake.